The Promenade isn’t as busy during the summer break, but there will be a record number of students living on campus. Most of the students on skateboards, bikes and foot are gone for the summer, but Grand Canyon University is no ghost town. In the four-month break between the spring and fall semesters, GCU hosts a multitude of activities and events on campus. There are nearly 20 high school graduations; a wide variety of sports, tech and science camps; student tours; community meetings; professional conferences; SAT testing; freshman orientation; summer school; and a tidal wave of doctoral learners. Campus tours are a frequent sight on campus any time of year. One of the summer’s signature events — the Back to School Clothing Drive — returns again in July. Volunteers will turn GCU Arena into a shopping mall with departments for shirts, shorts, underwear, skirts and school supplies for more than 4,500 children. “We don’t have all the students on campus, but we still stay busy during the summer,” said Helen Bleach, GCU director of University relations and campus events. Summer school for nearly 3,800 online and traditional students began Monday. An increasing number of cost-conscious students are taking classes over the summer to save money on tuition and housing, said Sarah Boeder, GCU’s executive vice president of operations. Tuition for summer classes is $310 per credit compared with $687.50 during the fall or spring semesters. “It makes sense for students who want to graduate faster to take summer classes. They can save both time and money,” Boeder said. Housing costs also are discounted, and a record 517 students are expected to live in Acacia Hall, up from fewer than 400 last summer. All residents must be enrolled in at least one class or be working on campus. More than 1,700 doctoral learners will take part in 16 weeklong residencies during the summer. Summer school undergraduates will be joined by a tidal wave of doctoral learners. Nearly 1,700 learners in the College of Doctoral Studies are expected to attend 16 weeklong residency events. 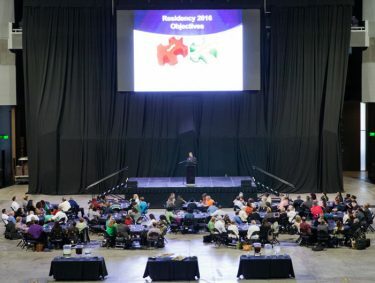 “This is the first full summer that we are bringing doctoral learners from all over the country to GCU,” said Dr. Michael Berger, dean of the College of Doctoral Studies. Last August, GCU’s residency program was moved to campus and Grand Canyon University Hotel. It previously had met at a nearby resort. Doctoral learners are required to attend two residencies, which help in researching and writing, before completing their dissertation. 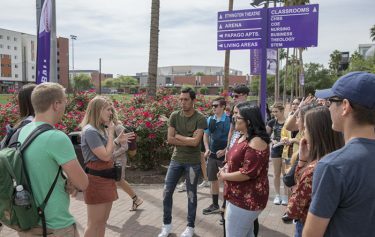 “Being on campus helps them connect to GCU and form vibrant connections that overcome distance,” Berger said. Summer also is a busy time for construction and maintenance crews. Repairs and updates are made in vacant dorms and apartments, said Matt Hopkins, Residence Life director. Construction also continues on the six-story Diamondback Apartments, set to open in August. That addition will bring the number of students living on campus to a record 11,000. 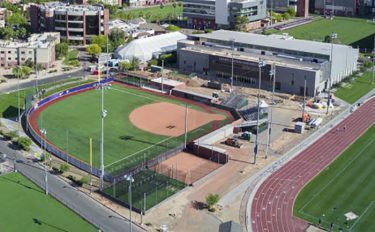 The permanent grandstand will be added to GCU Softball Stadium, and, just to the south, the Lopes Performance Center is being expanded. Work has begun on Phase II of the new GCU Softball Stadium — adding a permanent grandstand — and on the expansion of the Lopes Performance Center next door. An extensive remodel of Brazell Stadium, GCU’s 55-year-old baseball facility, will start after the final home game Wednesday night. 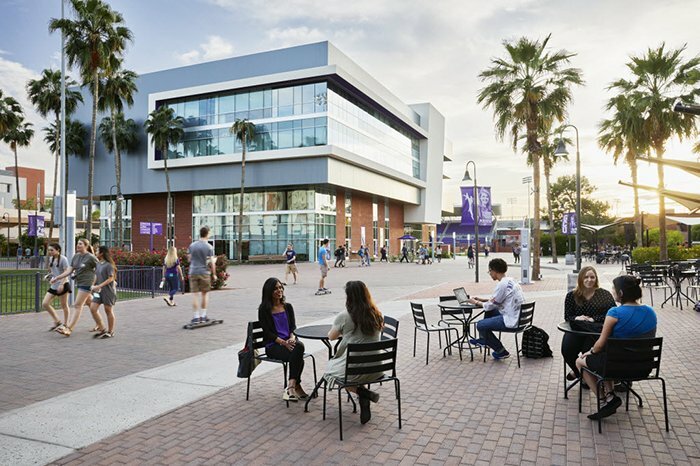 GCU summer dining offers a variety of eating options Monday through Friday: Grand Canyon Beverage Company, Panda Express, Lean Canteen, Jamba Juice, The Grid convenience store and The Grill, GCU’s summertime pop-up restaurant in the Student Union. For the first time, The Grill is opening at 8:30 a.m. for breakfast. The lunch and dinner menu changes daily and is designed to appeal to appetites zapped by the summer heat. “I keep the menu of sandwiches and salads seasonal and change things up so nobody gets bored,” said Allen Dowe, GCU senior retail manager.